Happy Hump day my friends. Sorry I've been a little MIA from the blog this week. The flu has hit our household, and if it isn't hard enough to take care of a sick toddler, try doing it when you're sick yourself! Since we haven't been able to leave the house all week, I thought today would be a perfect day for a little beauty talk. 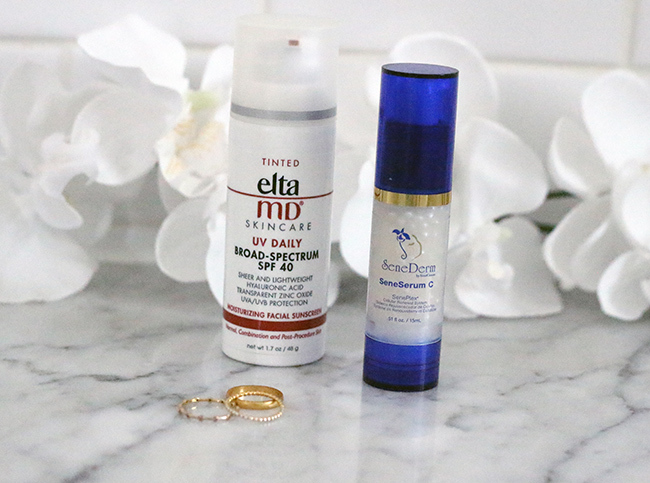 I've had a couple of people ask about my skin care routine, so I'm sharing my daily products, along with the two beauty items that EVERY woman should be using, no matter what age. Now I am not a beauty expert, and I do not have a degree in dermatology. However, I am a woman in my mid-thirties trying to prevent and reverse the signs of aging, and have visited my dermatologist more times in the past two months than I have seen my own sister (which if you know me, is a lot). I have learned some great things about skincare, which I'm happy to share with you today. One thing that I have learned, is that you don't need a fancy cleanser for washing your face. It's more about the creams and serums that you put on after. 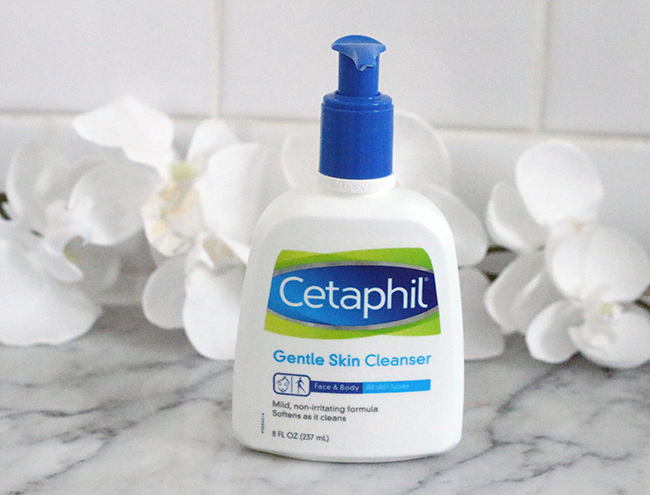 You do want to use one that won't strip the moisture from your face, which is why I love Cetaphil Gentle Skin Cleanser. Cetaphil has been a staple in my skin care routine for years, and the fact that they use it in my dermatologist office, only proves that it's a great drug store brand. I do love splurging on a nice face wash every so often, and at the moment I have been using Pur-lisse along with my Cetaphil. 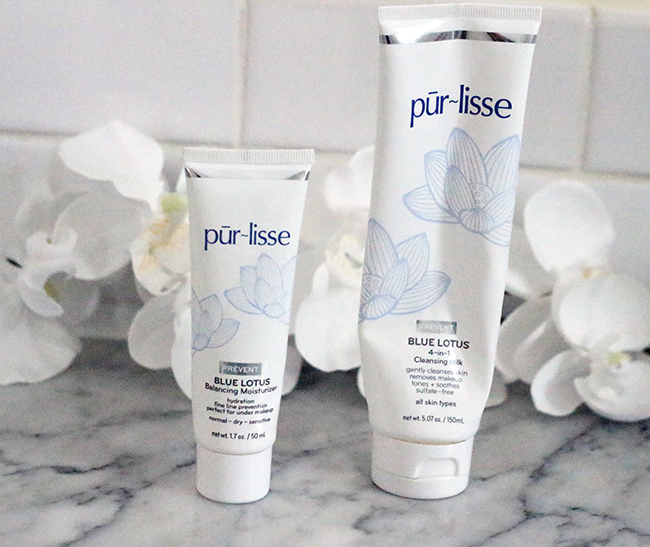 Pur-lisse is a brand that combines blue lotus and white tea, giving you products that are gentle on the skin, while providing anti-aging benefits. They are also free of parabens, petrochemicals, fragrance, GMO, sulfates, and phthalates. I was sent a few products to try from the brand, and instantly fell in love. The Blue Lotus Cleansing Milk is a light cleanser that leaves my face feeling smooth and moisturized. It's infused with soy milk, whole oats, and white tea, which makes it super gentle on my skin. I have also been loving the Blue Lotus Balancing Moisturizer. It adds the perfect amount of moisture to my dry skin without feeling heavy. 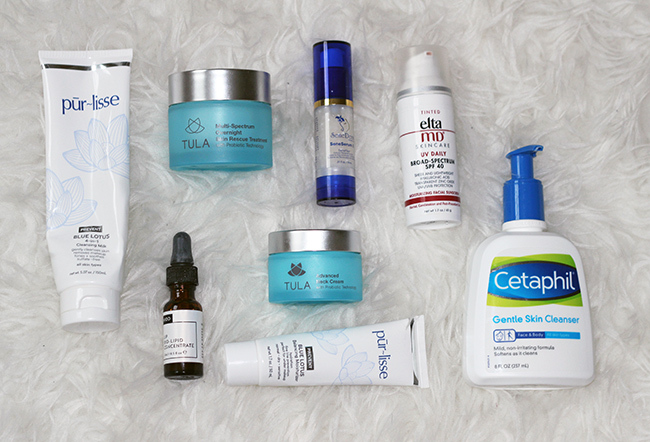 Their products have been perfect for my sensitive skin, and even though these products were gifted to me for review, I will continue to use them in my daily routine. Okay, so I am sure you can tell by all my photos, that I have very thin lips. If I am being honest, I am dying for lip injections, but have heard too many horror stories that I'm scared to get them. I have tried almost every lip plumper under the sun, and nothing has ever worked on me, not even in the slightest. That is until I discovered NIOD Bio-Lipid Concentrate. This really works! Within seconds after applying, my lips are plump and noticeably larger. It does turn the skin around my lips red, however that only lasts for a few minutes. It also doesn't have the best smell when applying, but that is something that I quickly got over. I love that it makes me look like I actually have lips! Now, lets talk about the two products that at every woman, whether she is twenty-five or seventy-five, should be using daily on her face. Those two products are SPF and a Vitamin C Serum. If only I started using these in my early twenties, I would have saved myself a lot of money in dermatology bills. However, it's not too late to start using these products. Not only will they help prevent the aging process, but Vitamin C stimulates the collagen production, and can help with reversing the signs of aging. For an SPF, it needs to be one that is separate from your beauty products. SPF in lotions, BB creams, and foundations do not provide you with enough protection to prevent age spots and wrinkles. It should also be worn EVERYDAY. It's a given when you're spending the day at the beach, but did you know that a five minute drive to the grocery store can cause years of damage on your skin? A lot of us never think about the sunlight that can be effecting our skin that comes though a window, or the windshield of our cars, which is why wearing an SPF everyday is crucial for keeping your skin looking young and healthy. My dermatologist introduced me to Ulta MD, and I love this SPF. Not only does it provide great protection, but it's not greasy, and it feels light when putting it on. You really fell like you aren't wearing any lotion. Plus, it doesn't have a smell. I can't stand the smell of suntan lotion, unless I'm at the beach. The other product every woman should be using daily is a Vitamin C Serum. You want to be careful when buying them, because a lot of brands list Vitamin C on their labels, but don't actually have the active or pure ingredient in their products, or have very little of it. I would recommend investing in a slightly higher end line for this product, as you will see better results. You want to be looking for products that list L' Ascorbic Acid or Tetrahexyldecyl Ascorbate in the ingredients. 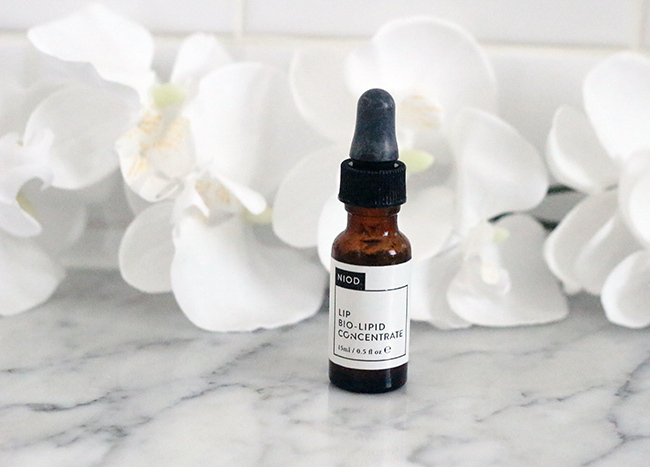 L'Ascorbic acid is the pure form of Vitamin C. Tetrahexyldecyl Ascorbate is a solid, oil-soluble form of vitamin C, which because of it's fatty acids, is believed to penetrate into the skin better, giving you great benefits and anti-aging results. The Vitamin C serum that my dermatologist suggested was $163. Although I have heard great things about the product, it is a little pricy to be buying on a regular basis. That's when I was excited to learn about SeneGence's SenseSerum-C. I have heard people rave about the product, that I started using it a month ago. Not only does it have the active ingredients, but it goes on smoothly, is not greasy, and is only $65. No, $65 is not cheap, but compared to $163 it's a price I'll pay for young, healthy skin. (If you are interested in learning more about SeneSerum-C, please send me an email). Now these three products I am still testing out. 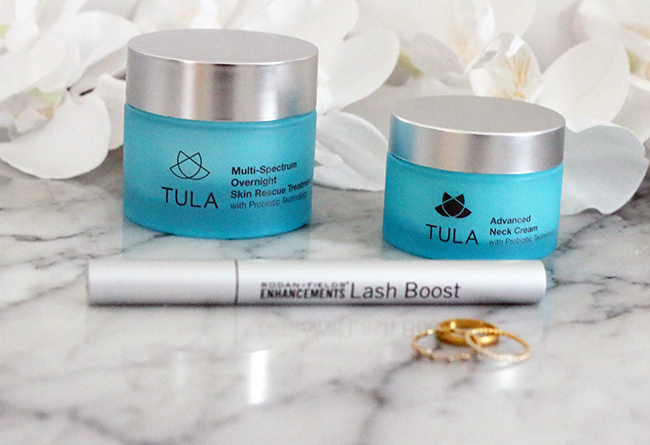 Tula send me their Overnight Skin Rescue Treatment and Advanced Neck Cream to try. I've only been using them for a couple of weeks, and will let you know more on my results soon. So far, I've been loving the overnight cream. I use it each night before bed, and love the moisture it provides to my dry skin. I also love that I wake up with my face feeling soft and hydrated. I was excited to try the Advanced Neck Cream, since I recently started noticing fine lines on my neck. I haven't seen any improvement yet, but am hoping to see results soon. I am also trying out Rodan and Fields lash boost. I have been using it for about 6 weeks now, and haven't noticed any growth in my lashes. However, products usually take longer on me than others to see results, so I am not expecting to see a difference until 10-12 weeks of use, and will keep you updated. There you have it, the products that I use on a daily basis. I do also use a skin lightening cream (for dark spots) and I have a prescription ache and retinoid lotion. Most of these I've only recently started using, so I'm hoping to see great results in the near future. What are the beauty products that you use on a daily basis, and absolutely love? *This post contains sponsored content and affiliate links. All thoughts and opinions are my own. Than you for supporting the brands that I love here on Threads for Thomas. Tula is one of my favorites! Love their overnight cream! So far, I've been loving it!! Thank you! I always love finding drug store brands that work well. These are some great tips. Love cetaphil! Thank you! I feel like its a staple in so many people's beauty cabinet! Cetaphil is my go-to and recommended by my dermatologist. After having kids, I started getting acne and it's continued. I recently received a prescription of TactuPump (mix of benzoyl peroxide & adapalene) that's dries my face out but finally after years of acne has cleared up my skin. Now I need a good moisturiser, like the one your recommended, to help with the dryness. I have the same problem. After having my boys, my face started breaking out, so I am on adapalene, and one other item, I can't think of the name.